Imagine we have a basket of apples. I track this apples using a piece of paper and a pencil. 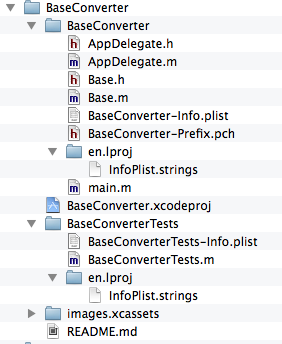 We see that groups in Xcode project navigator and folders in Finder may not be of exact match. 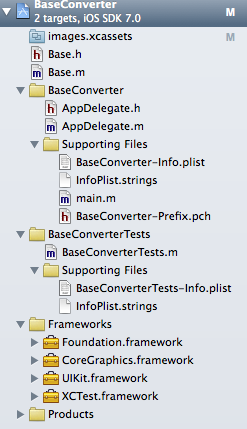 The file named BaseConverter.xcodeproj contains all information about how to build the project. We can open the project by double-click it. The Supporting files group doesn’t show itself on disk, it is just a way to combine some items together inside Xcode project so that’ll be easier to work with them. Contents of this group is real, however, and we can find this files on disk. Similar story happens with Base Converter group. The group exists only inside Xcode project, but the files are present in Finder. Frameworks and Products groups are different cases – they don’t correspond to anything in the project folder, but they correspond to real things that the project needs to build and run. Also, as new users, we may get in trouble by messing with project folder in Finder. The easiest way to avoid this is to perform all our interactions with the project through project window in Xcode.